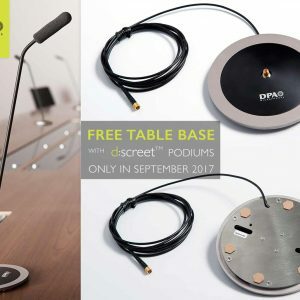 Buy any DPA d:screet™ Podium Microphone this September and get their DM6000 Microphone Base (microdot version) absolutely free. This represents a saving of £125.00. Available 01st – 30th September 2017 only from Authorised UK & Ireland DPA Microphones Dealers. The DPA d:screet™ SC4098 podium microphone features a directional (supercardioid) polar pattern with the extreme clarity and performance DPA miniature capsules are known for. Available in three boom lengths – 15cm, 30cm and 45cm. One of the biggest issues faced when using lectern mics is the speaker drifting off-axis. The DPA d:screet SC4098 capsule is designed to have a much more natural sounding off axis response than other podium mics, ensuring the speaker is always heard clearly while still attenuating ambient noise. Find out more here. The DPA Microphone Base (DM6000) brings sleek Scandinavian design and superior audio technology seamlessly into your meeting rooms. Made of brushed aluminium and including a built-in shock mount system, The Microphone Base suppresses most all unwanted handling or vibration noise from the table or podium. Hidden mounting holes below the top cover allow for permanent mounting to any flat surface, and it looks just great. It can be ceiling-mounted upside down or positioned on top of a table. The cost of a DAD6001-BC XLR adapter, which connects to the end of the base’s microdot cable for plugging into standard XLR, will also be reduced to £65 (usually £80) when bought together with the podium mic. The DPA DAD6001-BC XLR adapter regulates the voltage sent to the SC4098 capsule and ensures that the highest quality audio capture is possible. Ask your dealer for more information. Don’t miss this chance to save over £120 on your podium microphones solution. If you have questions please get in touch. Find an authorised DPA dealer.